My DB's latest breakfast trend is 30g of walnuts. Rather than spend €13.60 on the hotel's buffet brekkie, we had a handful of walnuts each... and then went into Salers to get coffee, and a croissant for me, because, frankly, walnuts is not a breakfast worthy of the title. My DB warned me that I couldn't just waltz into a bar with a bag of croissants and start eating - it wasn't done, and anyway, the bar would probably want to sell me a croissant (with mark-up). Maybe in some places... but we found a bar that was just opening - the lady was still cleaning the floor - and when I asked if I could eat my croissant with my coffee, she said it would be fine. Result! 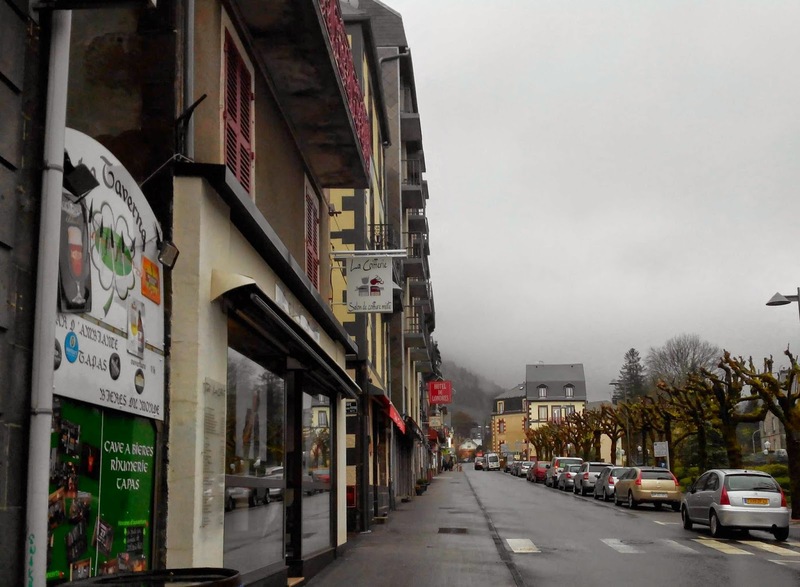 We drove around the village a bit, made the mistake of not buying bread and cheese, and set off into the wilderness along the Col de Neronne towards Puy Mary (still closed). I'm sure the views would have been fantastic had they not been shrouded in low clouds. Visibility was extremely bad, which made driving along the narrow lanes somewhat hairy. Having missed the Col de Neronne, we then missed the Vallée du Mars thanks to the pouring rain and low clouds. The morning was advancing, and we had nothing for lunch (except more walnuts), so we kept a look-out for a boulangerie. Hamlet after hamlet yielded not a single shop, although cows and green pastures were abundant. The one tiny Vival store we found was out of bread, so we decided we'd better just drive to Mauriac, population of more than 10 (actually around 3800), where there would be a proper supermarket. We found a picnic spot near a viaduct and, although it had stopped raining, it was very damp, so we ate in the car (hurrah!). The Laguiole was excellent, the Salers/Cantal less so. In the afternoon, we drove along the Gorges de la Rhue in the rain, didn't see much, but the road did go through a luscious forest of moss-covered trees and rocks. At one point we followed a sign to an 'Arbre remarkable 340m' up a delightful forest track. We went all the way to the end, but didn't see it, so turned round and looked more carefully on the way back. Sure enough, we found it - a rotting 200 year old beech tree 43 metres high... Remarkable? As we crossed the border into Puy de Dome, the sun promptly came out. Miracle! It made the moorlands which were carpeted in thousands of tiny jonquils positively glow. We made a short detour to see the ski resort Super Besse, still with a little snow clinging to the hillsides as my DB likes to see ski resorts out of season. There was a surprising number of vehicles about, and the cable cars were running, although the top of the hill was shrouded in cloud so I don't know what you were supposed to do once you got to the top! I always understood that if you were on a mountain and caught in fog, you should stay put in case you fell off. Maybe there's a restaurant chalet up there offering consolation for the fog-bound! In general, I thought the resort looked very down-at-heel without its improving cover of snow. The weather closed in again, and we drove on through rain and 100% humidity trying to spot volcanoes. We were getting very bored with driving and not seeing much. At last we arrived at Le Mont-Dore (of the cheese you melt) which is a spa town and ski resort with casino and where we were to stay the night. Our hotel, La Russie, is up at the top on Trip Advisor for the town, god knows why. It was noisy, very basic, and had red plastic bedside lights that you couldn't read by, but were great for pretending you were in a cheap brothel. Our room was opposite a wooden staircase which was deafening when people pounded down in their winter boots. The town is a tourist trap, so every other shop sells over-priced goods and produce. That said, the place was packed, and the restaurant where we wanted to try a truffade was full. Actually, we weren't that hungry so snacked on cheese and wine in our room whilst watching the film 'Fonzi', the story of a student who donated his sperm for scientific research, he thought, only to find out twenty years later he was the biological father of 530 young people. I'm not a great fan of French films, but this one was charming and funny. The bread, cheese, and wine and bits and bobs went down very well, especially the Laguiole (which disappeared). A last look at the weather forecast for the next day - cloudy with sunny intervals - had us wondering if we should stay or should we go. My wife was born and brought up in the Auvergne; I have spent many lovely holidays in the Auvergne countryside chez her parents. We have stayed in Le Mont Dore a few times in The Grand Hotel. Grand is maybe a little enthusiastic, but it is full of charm and for the price of a normal room in the south we had a two room suite with turret and balcony! I felt like a princess! I have only visited in April and thing I remember most is the sound of rushing water as everything melts away. I think it rained too! 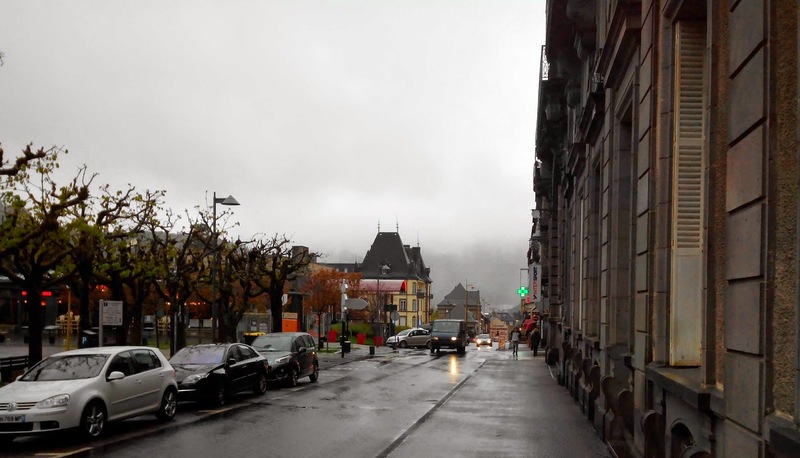 Ah, the joy of Auvergne...Just like you, every time I was in Auvergne, it was freezing. And raining. I was always cold in Auvergne for some reason....It will make you love where you live even more! Yes, or the Lake District. I've spent many holidays there in similar weather! This entire area of France sounds so beautiful if only the weather would cooperate. Doesn't bad weather bugger things up! How annoying. We also follow signs for interesting things to see such as your rotten tree! Tripadvisor came up trumps then with your brothel?! My belle-mere works in the Thermal Spa in Mont-Dore! She must be very busy! The place was packed.